Audi will be presenting the all-new Audi S6 2013 at the Frankfurt Auto Show along with other S Models - S6 Avant, S7 and S8. The new S6 uses the new 4.0 TFSI with 309 kW (420 hp) and a constant 550 Nm of torque. It accelerates the S6 takes in 4.8 seconds from zero to 100 km/h and has the electronically limited top speed of 250 km / h.
In a few days, Audi is presenting its new S models in Frankfurt for the first time the public. 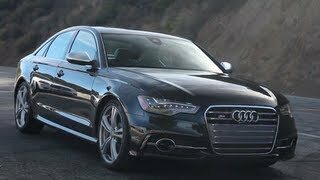 Coupled with low power consumption according to time, these characteristics distinguish the new S models from Audi.The downsizing strategy of the brand with the four rings around the S6 allows up to 25 percent less fuel and significantly more sporting driving performance. Athletic character, rich furnishings and subtle understatement - the Audi's S6 and S6 Avant scratch.Both models are sports cars for everyday use, with the practical qualities are no compromises.Their new engine, a V8 twin-turbo four liters, combines contemporary with plenty of power consumption low. the S6 and S6 Avant, use the new 4.0 TFSI in the version with 309 kW (420 hp).From 1400-5300 1/min twice the supercharged eight-cylinder power unit provides a constant 550 Nm of torque.It accelerates the S6 takes in 4.8 seconds from zero to 100 km / h, the S6 Avant, the exercise 4.9 seconds.The electronically limited top speed of 250 km / h in both models formality. The 4.0 TFSI transports the downsizing strategy of Audi in the high performance category.Compared to the engine in the predecessor model, the free absorbent with 5.2-liter V10, it makes even more sporty driving performance with a reduced fuel consumption by up to 25 percent.In S6, the average value is to just 9.7 liters per 100 km, in the S6 Avant 9.8 liters - so much its competitors at Audi. At this top result share many technologies, including the recuperation and start-stop system and the new cylinder management, have also called the "cylinder-on-demand".If the V8 off four cylinders under part load operation, is the Active Noise Cancellation system (ANC) is active. Four headliners in the built-in microphones record the noise inside a computer, they analyzed.If it detects disturbing elements of sound, it sends an anti-sound through the speakers of the sound system - it is superimposed on the background noise and removes it from the fact broadly. Regardless of which insulate active, electronically controlled engine mount through targeted counter pulses the low frequency vibrations.A sound actuator, dampers in the exhaust system, the cover of the engine and a newly developed dual-mass flywheel with centrifugal pendulum in the seven-speed S tronic also contribute to the melodious and sophisticated engine running. The power transmission build the S6 and S6 Avant, the further ahead through technology.The engine torque flows to a lightning-fast-shifting seven-speed S tronic.The permanent quattro all-wheel drive uses the self-locking center differential and torque vectoring.If desired, it completes with the Audi sport differential, which distributes the forces active between the rear wheels. The two new S models come standard with adaptive air suspension sport on board, the firm designed air suspension with variable damping lowers the body by ten millimeters.It delivers an ultra-precise handling without compromising on comfort.The powerful disc brakes, internally ventilated, have matte black painted calipers with S6-lettering.Audi also made ​​of carbon-ceramic discs. The S6 and S6 Avant roll as standard with cast aluminum wheels in a specific five-parallel-spoke design.Their size 8.5 J x 19 with 255/40 tires are the relative dimension.Alternatively, there are seven other wheel variants with 19 and 20 inches in diameter, four of them by quattro GmbH particularly exclusive look at the 20-inch Five-star-rotor design in titanium-look. The driving dynamics system Audi drive select in the two new S-series models.It takes in part to the characteristics of the accelerator, the switching points of the S tronic, the power assistance for the electromechanical steering and on the characteristics of the adaptive air suspension to - the driver can switch the operation of these systems into five levels.The optional sport differential and dynamic steering, which varies depending on the pace of their translation, can also be integrated into the system. on the dynamics of the Audi S6 and S6 Avant have the bodies high proportion - they are unusually easy because they consist of about 20 percent of aluminum.The Audi S6 1895 and brings only the S6 Avant 1950 kg curb weight on the scale, much less than its direct rivals. 4931 mm with 16 mm of the S6 is longer than the A6, the S6 Avant 4634 mm, the difference is 8 millimeters - the two sports models by giving a series of design details to identify.Your single-frame grille wears aluminum trim, double its horizontal struts are chrome, a chrome strip decorates the other front bumper.The housings of the exterior mirrors in aluminum look and shaped the distinctive side skirts. The S6 sedan features a spoiler on the tailgate, the Avant roof spoiler.In both models, the diffuser on the rear bumper held in Platinum Grey with a contrasting edge in aluminum finish.The four chrome tailpipes of the exhaust system are elliptically shaped.The S models are available in eight colors of paint, including the exclusive sound effects and Estoril crystal silver crystal prism effect.S6-V8T and lettering adorn the bodies. Sporty elegance characterizes also the interior of the S6 and S6 Avant of.The key, the leather sports steering wheel - with colorful stitching and aluminum shift paddles - as well as the tools wear badges S6, the illuminated door sill trims and the two displays (MMI and Driver Information System) greet the driver with the S6 logo.A red ring adorns the start-stop button, an aluminum brace the gear selector.The footrest is made ​​of shiny stainless steel, the pedals and the soft keys of the MMI operating system in aluminum finish. For the inlays are four materials are available.Matt brushed aluminum is standard, on request, there is carbon, Beaufort Fine grain ash brown layered naturel or oak wood.With headliner, instrument panel, seats and carpet, customers can choose from three colors - black, silver moon and goabeige (only for the seat covers).As a standard reference used is a mix of leather and Alcantara Perlnappa, alternatively, the varieties and Valcona Milano are available. Sports seats with electric lumbar support, seat depth adjustment and logos are embossed S-Series.Option, Audi offers two variants - the electrically adjustable comfort seats with memory function and the S sports seats with integrated head restraints and electric adjustment.They also bring with embossed S logo. The new Audi S6 and S6 Avant roll with a generous standard equipment in early 2012 to the dealers.It includes, among other things, xenon plus headlights with weather lights, LED taillights, the electromechanical parking brake and the driver information system with color display.The MMI Radio Plus integrates a Bluetooth interface, the Audi sound system, ten speakers. In all models, the new S-series of high-end options to choose from.Including the LED headlights, adaptive light, the ambient lighting, the convenience key, the head-up display, the parking aid plus with ambient camera electrically operated tailgate - also with sensor control - as well as the comfort seats with air-conditioning and massage function.The Avant, which offers up to 1,680 liters of luggage space, also the panoramic glass roof is in the price list. The driver assistance systems that work in close cooperation lie at the recent state of the art.It considers the security system Audi pre sense in various stages of development, the adaptive cruise control with Stop & Go function, the Audi side assist, the active lane assist, the speed limit display and the night view assist with marking detected pedestrians. In the infotainment systems, the range extends up to the MMI navigation plus - it brings a large hard drive, an eight-inch monitor and the pioneering touch input system with MMI.The top system can be used with the Bluetooth car phone combines online - it takes special Internet services in the car and binds to mobile devices via wireless.The Bang & Olufsen advanced sound system with 15 speakers impressed with its excellent sound.